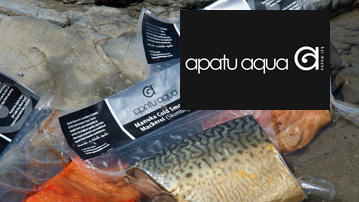 Specialising in producing traditional smoked fish, Apatu Aqua aims to provide fresh and smoked seafood to discerning seafood lovers. Based in Coopers Beach in the Far North, Hamish and Nichola Apatu have been catching and smoking fish for five years. To achieve their great tasting products they use fresh high quality ingredients including native manuka to give their fish a natural smoke flavour. They are also the team behind New Zealand’s first kina pate. Apatu Aqua offers a large range of products that can be purchased as smoked, fresh or pate form. Their smoked products include Snapper, Kingfish, Trevally, Marlin, Salmon, Mullet, Kahawai and Roe. They also make three pates – Smoked Eel, Smoked Fish and their award winning Kina Pate. Fish is caught by a local fisherman using the long-line method of fishing to ensure premium quality fresh fish. Eel is harvested from our clear Northland streams and rivers. All fish is vacuum packed and random weight varying between 100gm to 450gm depending on product. Fish products have a shelf life of 4 weeks (loose fish has a shelf life of 1 week) refrigerated at 0 – 4 degrees. Loose product is also available (no vacuum packing).